I am excited to post on the topic of de-cluttering and organizing your home! I have always liked to organize, put things in order, and get rid of things! 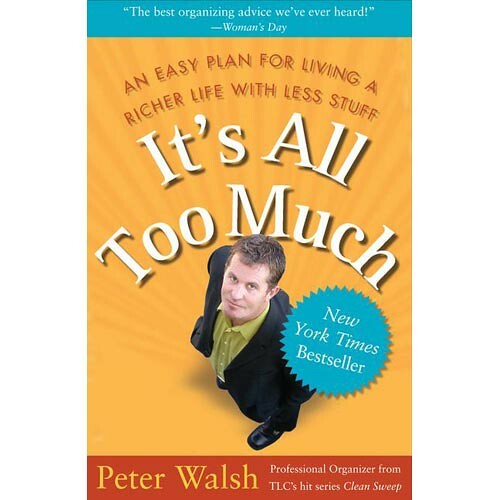 I have started reading An Easy Plan For Living A Richer Life With Less Stuff : It's All Too Much by Peter Walsh. Funny story, I acquired this book by trading old books for this one at a local secondhand book store in Fort Collins, Colorado. It's a good way to get rid of the old books you don't need for different functional ones! Unfortunately my stuff got donated before I could get a picture for this post! I had bags of clothes, shoes, jewelry, etc. in my parent's garage (where we are currently living) ready to be taken to Goodwill. Then I decided to write a post about this topic, made my bed, and ran to the garage to grab the stuff to lay out on my bed, but it was already dropped off and donated. Ha. Better gone than in the garage though! I just wanted to share a few tips to help YOU go through your stuff and clear up your home! 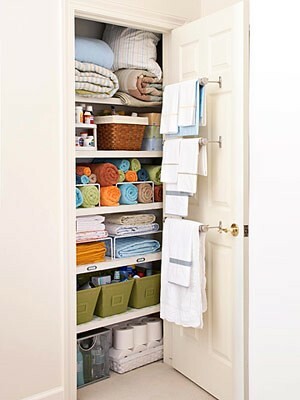 You will feel more comfortable, relaxed, and at peace with less clutter! I, myself, am NO expert in this topic which is why I am going to take some key points from the previously mentioned book to get you started! [PS. This post is totally not sponsored. I just like this stuff.] You can buy the book here for only $4 (or you can use my tips for freee!). There are many phases of the de-cluttering process and this one is more of a surface one. It is one that is not meant to deal with your sports trophies or your artwork from kindergarten or brilliant A papers from college that you put SO much time and effort into...so this is the easier stuff. Fast will become your new mantra as you start to tackle your stuff in your spaces! Pick an hour in the week, 10 minutes a day, or a whole day to get yourself going! Peter recommends just picking a day to get a ton of stuff done at once. 1. Do I use this? 2. How long has it been since I've used it? 3. Will I use it again? 4. Is it worth the space it takes up in my house? These questions are great...need to remind myself of these! Is your apartment a storage unit? Nope. Get it out. Return it to its owners. If they are not wanting to take it back, give it away, sell it, throw it in the trash, get it out! It is depriving you of using your space in the most efficient way! Feed the trashcan! It is your friend! Make it a game with your roommates or your husband to see who can get rid of the most stuff! Now you have the plan, now do it! Don't argue. If you think something your spouse wants to keep is trash, deal with it later. You are on the same team! You both want a clutter free home! And remember, this is a rough de-cluttering session. Keep: You use it in your home. It is critical and you use it all of the time! This also includes stuff that you cannot bear to get rid of at this moment. Trash: This is a victory! Don't stop until you are done. Don't end up with a bigger mess than you began with! Put things away as best as you can. Drop off the donations at Goodwill. Contact people whose stuff you have borrowed. Evaluate and congratulate. Now don't go celebrate by buying a cool piece of artwork or a random knickknack for the shelf or especially more organization pieces. [I love buying shelving and containers!] Celebrate by eating a nice dinner out on the town or catching a movie! Don't buy anything in this process! Do not let any INFLOW enter the home during this stage! And of course if you can donate your stuff to a charity, an individual in need, a women's shelter or any other good cause other than DI or Goodwill, the better! Then the people who are in need don't have to pay for it! I wanted to find an individual who could use my clothes but it didn't happen this time but I can always get rid of more, so next time! If anyone reading this is from Colorado and interested, let me know! 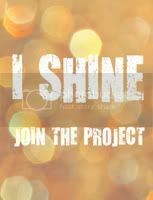 You can also take this challenge from The Shine Project; Ashley challenges you to donate your unworn or extra clothes to an individual or a charity! love this ashley! i'm totally the worst and this helped me a lot. Love it! :) I am someone who has no trouble getting Rid of things. I do however need to show this to my mother. She could use it w her craft stuff! Haha! Actually now that I'm done with the craft room it doesn't seem too bad! It's amazing what some organizing can do. :) great tips and thanks for reminding me about this post! This is awesome. I can't wait to declutter my home now!